Cat diseases can cause a variety of symptoms, including lethargy, weight loss, eye discharge, loss of appetite, and more. Learning to identify these illnesses and their symptoms may help you get a better understanding of the medical needs of your pet. Keep in mind, these charts provide helpful general information, but they are not intended to be a substitute for professional veterinary care. Cat illnesses can be broken down into several categories: degenerative, metabolic, cancer, infectious, or inflammatory with some overlap between the categories. Many diseases are difficult to diagnose because the symptoms overlap with other diseases. A degenerative disease occurs when parts of the body begin to break down over time. Arthritis Reluctance to jump, run, or play. Avoiding social interaction or being touched. Changes in urinary habits, grooming excessively. Physical therapy, controlled exercise, supplements and medications, weight loss, environmental management. Good with treatment. Bad breath and bleeding gums, pawing at the mouth, drooling and loss of appetite. Picky or fussy appetite. Dental cleaning under anesthesia. Root planing, surgery, or tooth removal. Antibiotics and pain medication. Normal life span with proper tooth care. Cognitive Dysfunction Unusual vocalization, elimination outside the litterbox, restlessness, excessive sleeping. Anti-oxidants, environmental changes, possibly medication. Guarded - quality of life depends on specific symptoms. Progressive Retinal Atrophy Blindness - running into furniture, easily startled, dilated pupils, reluctance to move around. None. Genetic tests can identify carriers to identify cats that can pass the disease to their offspring. Blindness by 3 - 5 years of age. Not life-threatening. Hypertrophic Cardiomyopathy Labored breathing, rapid breathing, panting, sudden hind limb paralysis. Some cats have no symptoms or can die suddenly. Varies with severity. Hospitalization, oxygen, and diuretic medication. Chest drainage. Other oral medications. Poor long-term, but fair with quick diagnosis and medication. These diseases are those that occur in the organs or blood that affect the metabolism of your cat. The following is a list of diseases and symptoms that affect a feline's metabolic system. Cholangiohepatitis (Liver Disease) Anorexia and weight loss, vomiting and diarrhea, or lethargy. Some cats show jaundice (in the whites of the eyes, gums, and skin). Hospitalization for fluids and nutritional support. Long-term antibiotic treatment, anti-oxidants, and supplements. Poor without early and aggressive treatment, fair with treatment. Diabetes Mellitus Increase in urination and thirst, rapid weight loss, and increased appetite. A change in gait or hind limb weakness can sometimes occur. Insulin injections and a special diet. Hospitalization if pet experiences complications. Good if treated, but the cat can die from diabetes if not treated. Kidney Disease Increased thirst and urination, rapid weight loss, loss of appetite, and lethargy. Bad breath, seizures, blindness, or stroke can occur in serious cases. A prescription diet, blood pressure medication, fluids, potassium supplements, and erythropoietin injections may be needed to manage kidney disease. Poor in the long-term, but fair with early recognition and treatment. Hepatic Lipidosis (Liver Disease) Anorexia, drooling, weight loss, lethargy, vomiting, diarrhea, and weakness is common. Hospitalization for fluids and nutritional support. Antibiotics, anti-nausea medicines, and vitamins. Good if treated promptly and aggressively. Hyperthyroidism Weight loss and increased appetite. Vomiting or diarrhea. Increased activity level, restlessness, increased thirst and urination. Anti-thyroid medication, radio-iodine treatment, surgery, or prescription diet. Normal life span if treated. Unfortunately, cancer is very common in our feline friends, especially once they reach their senior years. Every type of cancer exhibits different symptoms and behaviors. Lymphoma Poor appetite, lethargy, and weight loss are common. Chronic vomiting or diarrhea. Some cats develop labored breathing. Usually chemotherapy and prednisolone. Some forms may need surgery. Poor without treatment. Fair to good with chemotherapy, but it depends on the specific subtype of lymphoma. Mammary Gland Tumors Usually occurs in unspayed females. Lumps noted in the mammary tissue, sometimes with open sores. Radical mastectomy (surgery) is required for the best outcome. Possible chemotherapy. Fair with surgery. Tumors larger than 3 cm are more likely to recur or spread. Squamous Cell Carcinoma Scabbed sores, especially on the ears and nose. Loss of appetite, sores in the mouth. Surgery is usually the best option. Radiation therapy or cryotherapy. Poor without early identification, particularly in the mouth. Good if skin sores are completely removed. Fibrosarcoma Firm lumps under the skin, especially if over 2 cm in size or present for more than 3 months. Can be associated with vaccine injection sites. Early and aggressive surgery is the best option. Possible chemotherapy or radiation treatment. Good with successful surgery. Guarded if the tumor recurs after surgery. Intestinal Adenocarcinoma Weight loss and chronic vomiting are common. Diarrhea, lethargy, inappetence, and constipation. Surgery, possible chemotherapy. Poor without treatment. Guarded even with surgery. Infectious diseases are those that can be transmitted from one cat to another. A virus, fungus, parasite or bacteria may cause an infectious disease. The following is a list of cat diseases and symptoms that are infectious, some of which may be prevented through vaccinations. Cat Flu Runny eyes and nose, coughing and sneezing, and fever. Supportive care, including fluid therapy, antibiotics to prevent secondary bacterial infections Good for most cats. Bartonellosis None in most cats. Inflammation of the gums and mouth, fever, lethargy, vomiting, diarrhea, ocular inflammation, sneezing, or ocular and nasal discharge. Antibiotics in some cases Good overall. Skin lesions and crusty patches; hair loss on head, face, and neck. Lime sulfur dips, oral ivermectin. Treat any underlying and predisposing condition. Normal lifespan, but may require ongoing treatment. Feline Leukemia Weight loss, fever, loss of appetite, enlarged lymph nodes, pale gums, labored breathing. Treat symptoms, manage the quality of life. Poor with active infections. Treatment for feline leukemia does not directly affect the virus. Upper Respiratory Disease Runny nose and eyes, sneezing and fever, and loss of appetite and depression. Hospitalization in severe cases. Fluids, antibiotics, lysine. Environmental humidification. Nutritional support. Normal life span if treated. Potentially life-threatening in geriatric, pediatric, or debilitated cats. May be prevented with vaccination. Hair loss, red and crusty skin. Some cats lack symptoms but are still infected. Topical antifungal medication and/or lime sulfur dips. Oral medications are sometimes needed. Good, but some cats can remain chronically infected. Panleukopenia (Feline Distemper) Vomiting, diarrhea, fever, lethargy, loss of appetite, and nasal discharge Hospitalization for fluids, antibiotics, anti-nausea medicine, nutritional support, and close monitoring. Distemper is potentially life-threatening, especially to kittens. Preventable with vaccination. Feline Immunodeficiency Virus Weight loss, fever, loss of appetite, weakness, vomiting, swollen lymph nodes, poor coat condition, inflammation of the gums, and chronic or recurrent infections. No specific treatment is available. Treatment is only symptomatic and is not always needed. The cat will have a normal life span when following a preventative care program. Rabies Furious form produces excitement, restlessness, aggressive behavior, and muscle spasms. The paralytic form produces a lack of coordination and eventual paralysis. None. Fatal in all cases once infected. Preventable with vaccination. Toxoplasmosis Most cats show no symptoms. Fever, loss of appetite, and lethargy. Coughing, increased respiratory rate and effort to breathe. Tremors and uncoordinated gait, or ocular inflammation. Clindamycin or other antibiotics. Good. Responds quickly to treatment. Ear Mites Dark or tan dried discharge in the ears. Scratching at the ears or shaking head frequently. Scabs around the ears. Ear cleaning. Topical ear medications or ivermectins. Good. Abscess Usually occurs after a bite-wound becomes infected. Painful swelling in the skin. Bloody discharge with a foul odor. Limping. Surgery may be needed. Antibiotics, pain medications. Good with treatment. Eosinophilic Granuloma Complex Ulcerated sores on the lips, raised red or yellow plaques on the skin, enlarged lymph nodes, itching. Treat any underlying allergy. Steroid medications, antihistamines, antibiotics, immunomodulating or immunosuppressive medications. Flea control may be needed. Good, but long-term treatment may be required. Miliary Dermatitis Itchy rash scattered over the body. Treat any underlying allergy. Steroid medications, flea treatment, or a prescription diet may be needed. Good. Feline Asthma Chronic and persistent wheezing, coughing and noisy breathing; weight loss and inactivity; some animals exhibit abnormally hunched posture. Oral or inhaled steroids, bronchodilators, possibly antibiotics. Normal life span if treated, but a crisis can be life-threatening. Pancreatitis Loss of appetite and dehydration. Vomiting, diarrhea, abdominal pain, and lethargy. Shock and collapse in severe cases. Outpatient or in-hospital care depending on severity. Fluids, antacids, anti-emetics, pain medication, possibly antibiotics. Feeding tubes may be recommended. Serious cases of pancreatitis are life-threatening. Fair prognosis otherwise but can recur. Feline Infectious Peritonitis (FIP) Fever, lethargy and weight loss. Effusive FIP causes fluid build up in the chest or abdomen can result in labored breathing or abdominal distention. Organ failure can occur. Prednisolone, recombinant feline interferon, and pentoxifylline can be tried, but are not very effective. Poor - inevitably fatal. Lower Urinary Tract Disease Symptoms include straining to urinate, bloody urine, or frequent urination. Urinary accidents outside the litterbox can occur. Lethargy, vomiting, pain, collapse, and shock if a urinary blockage occurs. Fluids, pain medication, antispasmodic, anxiety medications, and antibiotics are commonly used. Hospitalization or surgery are sometimes needed. Good if treated promptly. Urinary blockage is rapidly life-threatening if untreated. Vestibular Disease Sudden head tilt and loss of balance. Abnormal eye movement from side to side. Vomiting or drooling. May require hospitalization and sedation. Fluids, anti-nausea medicine, and antibiotics are often needed. Good, typically improves in a few days. Stomatitis Bad breath, red and inflamed gums, poor appetite, and tooth loss. Dental care - tooth brushing. Dental extractions and pain medication. Good with treatment. 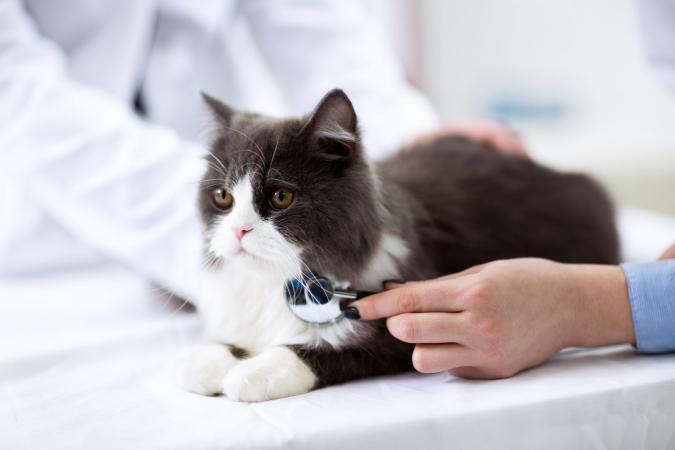 Your veterinarian is the only person truly qualified to diagnose your pet's condition, so make an appointment as soon as you notice any signs of ill health. Early treatment is often more effective, and it's your best chance to make your pet more comfortable and hopefully help him recover.